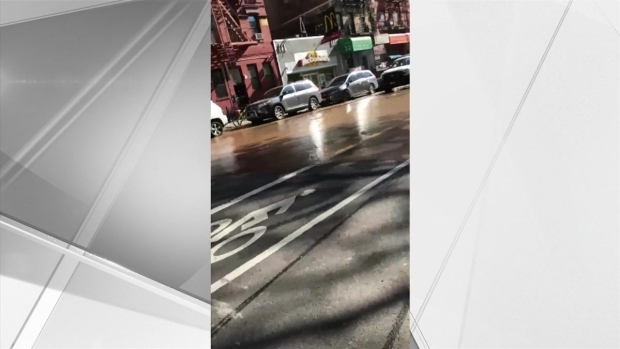 Crews are working to repair a massive sinkhole on the Lower East Side after it temporarily knocked out water to about 150 customers and 10 businesses in the area, according to officials. Ida Siegal reports. 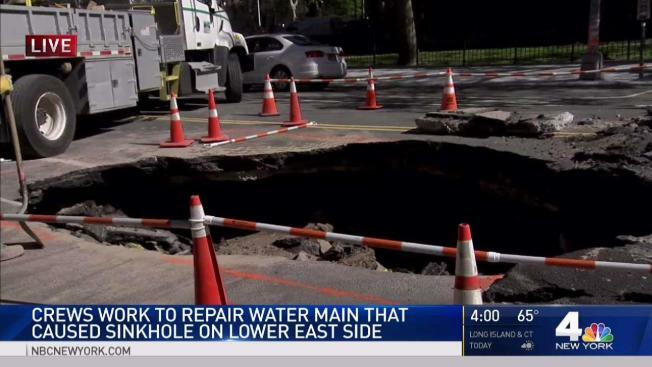 A massive sinkhole is growing on the Lower East Side after it temporarily knocked out water to about 150 customers and 10 businesses in the area, according to officials. The ground at Madison Street started opening up Wednesday morning when an MTA bus traveled over it, causing the street to buckle and creating a small hole, according to a witness at a restaurant facing the street. The bus went on, and the sinkhole grew. "There was a loud bang, a loud boom," said William Cotto. "I came outside, saw the hole. Water started coming up." The ground at Madison Street started opening up Wednesday morning. "Thank God it was alternate side parking," he added, noting that cars would have been parked on the spot where the ground caved. Department of Environmental Protection crews are on the scene excavating to try and find the source of the underground leak. They made temporary repairs to a 12-inch water main in the meantime, restoring water to customers in the area. Ashley Alvarez, who works at the El Castillo de Madison restaurant facing the street, said there's been problems in the past at the spot where the ground opened. "There was a small little hole and they would come and patch it up and leave, then come back again when the hole came," she said. "Now it's too late because because now we have that big hole." Alvarez said despite the water outage, the restaurant was able to cook and stay open. "They gave us enough time to actually get water," she said. "And since we have a lot of buckets, we put water there."